Inlite’s CcIQA is a Windows application, which performs check image analysis and reports the results as specified by the ANSI X9 specifications (see ANSI X9 Test Registry and Standards section), as well as additional file conformance checks. A pair of images, front then back, in a single two (2) page file. CcIQA can be executed as a Windows Application with a User Interface (UI) or as a Command Line processor, in which case it can be executed from another application, as a part of batch processing or from a high level Workflow System. Check Images Source text box – Specify a single file or a directory containing check images (front and rear). Use Select Dir or Select File buttons to browse the source. If the text box points to non-ICL file, the program will try to find matching front or rear image. If more then one file or directory is entered, each should be in quotes, separated by spaces, e.g: "file1" "dir2"
Check Building Rules – specifies location of XML file information how to match front and rear image pairs (See Check Building Rules File). The default configuration file CheckBuildRules.CcIqa.xml is installed in application directory. Use […] button to browse to the rules file. Use the Validate button to check the syntax of the rules file. Specify location of XML file with CcIQA configuration parameters (see CcIQA	Configuration File). Default configuration file IqaFrontRear.CcIqa.xml is installed in application directory. Use […] button to browse to configuration file. Use Edit button to edit contents of specified file using specified XML Editor. Use Validate button to check syntax of configuration file. Save Original Images – enable saving of check images in a multipage TIFF file. File is located in IQA subdirectory of original file directory. Name of image file is input_filename_base .images.tif, where input_filename_base is base name portion of input file name. NOTE: Saving images slows down processing. Save Corrected Images – enable saving of corrected images of checks in a multipage TIFF file. Correction might include deskew, frame removal, etc. Name of image file is input_filename_base.docs.tif, where input_filename_base is	base name portion of input file name. XML Editor – specifies file to edit configuration and Check Building rules files. Use […] button to browse to XML editor. Cancel Button – allows user to cancel measurement in progress. Enabled only during measurements. Show Results Button – displays last measurement results using application specified in Windows for viewing XML files. Often it is an Internet Explorer. Saves Results Button – saves last measurement results in selected file. Default Button – resets UI controls to default value. Help Button – displays this file. About Button – displays information about application. Status – displays measurement status. source – File(s) or directory(s) containing check images or Image Cash Letter filename. File corresponds to Check Images Source value in UI. For batch processing at least one valid source is required. Each source should be in quotes, separated by spaces. -c"filename" – Configuration file location. This corresponds to IQA Configuration in UI. If not specified, default file is used. -r"filename" – Check Building rules file location. This corresponds to Check Building Rules in UI. If not specified, default file is used. -o"filename" – Results file location. -e"filename" – Error log file location. -uz – start command line processing. Display UI with status. Exit UI after processing. -ux – the same as –uz, but exit after processing. To execute processing from command line without UI: specify source(s) and use no –u? options. Note: Variable values are shown in italic. Attribute values separated by "|" represent the	permitted values. side – Optional. Valid values: front or rear. If omitted, the test set applies to both sides. If present, the test set applies only to the specified side. name – Optional. Name identifying test set in results. disable – Optional. Valid values 0 or 1. Default is 0. Allow to disable specific test set. name – Optional. Name identifying test in results. ParameterName – Parameter specification. Valid name parameter identifier element is one of the names present in the example file. The names are derived from X9 Registry. All parameters required for test should be specified. Value ranges are specified in X9 registry. The example file has recommended values, but the industry did not establish a unified set of values, and the user is free to change them. Note: Variable values are shown in italic. Attribute values separated by "|" represent valid expected values. Note: Variable values are shown in italic. Attribute values separated by "|" represent only valid values. FrontRearMatch – Specifies semi-column-separated list of match patterns. System searches for filenames that defers only by specified match pattern. Match pattern is 2 string, separated by column: front_string:rear_string. E,g. if match pattern is f.:b. Files 123f.tif and 123b.tif are matched. CBF can have any number of match patterns in a single or multiple FrontRearMatch elements. TiffInfo – Optional. If 1 – emits information about image format and geometry. ASC X9 Standards Committee on Banking is an Accredited Standards Committee (ASC) of American National Standards Institute (ANSI) is responsible for standardization in the area of Financial Services. • Reporting of test results is described in X9.100-180-2006 standard "Specifications for Electronic Exchange of Check and Image Data". Specifically test reporting is described in Section "Image Test Detail Record (Type 56)"
Note that the Type 54 record, preserved for compatibility with old X9.37-2003 standard is not recommended for use in new applications. However, if needed, tests implemented in ClearCheck21 IQA can be used to set fields in the Type 54 record as well. Inlite’s ClearCheck21 IQA is a software component that is packaged as a set of Windows COM objects for easy integration in various applications. It performs the measurements and reports the metrics and flags as required by the FSTC IQA tests listed in the X9 registry. 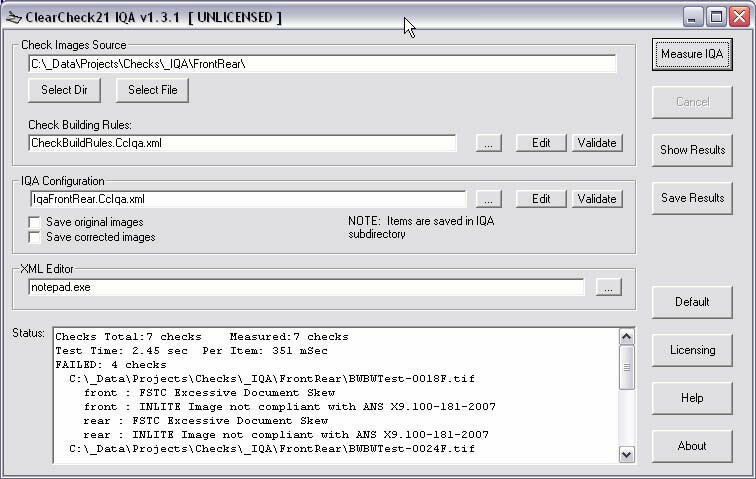 ClearCheck21 IQA implements the subset of FSTC tests that applies to bitonal images and is the most significant for the usability of check images. The scope of the testing exceeds the IQA metric requirements mandated by the Federal Reserve in Sep 2007 for exchange images. Develop your application using C# or VB6 examples supplied with ClearCheck21 IQA. Follow instructions below. Add COM references to ClearCheck21 IQA. References to ClearImage and VBA will be added automatically. Purchase ClearCheck21 IQA licences. Inlite will send you registration certificate. The nomenclature is represented as test/parameters/results. Sections are separated by ":"
Definition source: If derived from the X9 registry, all names start with X9. Note: CreateType56 method is customer application method that processes test results. For example it can prepare a Type 56 record to be added to a cash letter file. Rear image. Use the same syntax as shown above, replacing Front with Rear. Implement your own pass/fail logic, results of each test can be obtained directly. If errors are detected during test execution DoTests method return false, otherwise it returns true. Error information is reported in ErrorText properties. If no error is detect value of ErrorText property is an empty string.